Fans of the mega-successful Resident Evil franchise should begin their geeking out - and New York fans should begin their euphoric undulations. On Wednesday, June 14, at 11 a.m., the trailer for Retribution - the fifth installment of the series - will premiere at New York City's Regal Union Square Cinemas. 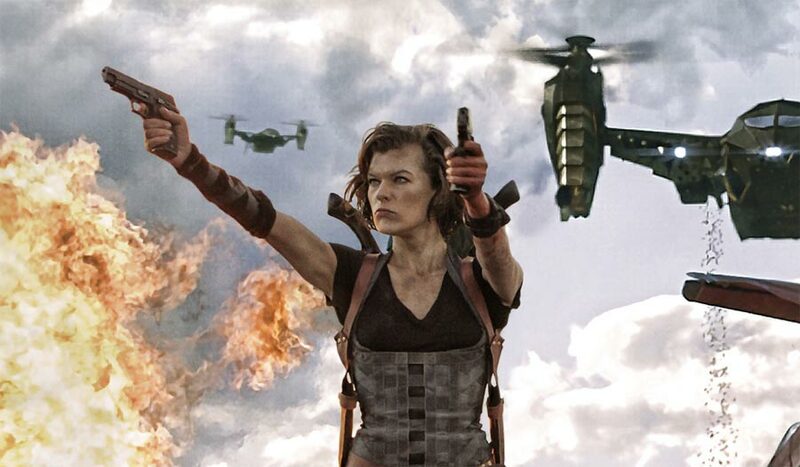 The trailer will be followed by a first-come, first-served Q&A with star Milla Jovovich. After the event, the full trailer will be released online. NEW YORK (June 7, 2012) – Milla Jovovich, star of RESIDENT EVIL: RETRIBUTION, will be participating in a live global streaming webchat leading up to the launch of the film’s trailer on Thursday, June 14th at 11:00am EST at the Regal Union Square Cinemas in New York. ScreenCrush.com’s Jordan Hoffman will be moderating. Fans will be able to attend the event by logging on to http://on.fb.me/MNNgZu and printing out an invitation; admittance will be granted on a first come first serve basis. Fans at home can log on to that same Facebook page to watch the Q&A live; the event is being translated into ten languages worldwide. Fans can also submit their questions online at http://on.fb.me/MNNgZu for a chance to get it answered live by Milla.The full trailer will be posted after the webchat on the film’s official site – http://www.residentevil-movie.com. RESIDENT EVIL: RETRIBUTION is the fifth installment of the wildly successful film franchise that has grossed nearly $700 million worldwide to date. Screen Gems will release RESIDENT EVIL: RETRIBUTION, in state-of-the art 3D, in the United States on September 14, 2012. Sony Pictures Releasing International will handle distribution in most international territories. Metropolitan Film Export will release in France and Constantin Film will release in Germany. In RESIDENT EVIL: RETRIBUTION, the Umbrella Corporation’s deadly T-virus continues to ravage the Earth, transforming the global population into legions of the flesh eating Undead. The human race’s last and only hope, ALICE (Milla Jovovich), awakens in the heart of Umbrella’s most clandestine operations facility and unveils more of her mysterious past as she delves further into the complex. Without a safe haven, Alice continues to hunt those responsible for the outbreak; a chase that takes her from Tokyo to New York, Washington, D.C. and Moscow, culminating in a mind-blowing revelation that will force her to rethink everything that she once thought to be true. Aided by newfound allies and familiar friends, Alice must fight to survive long enough to escape a hostile world on the brink of oblivion. The countdown has begun. Screen Gems, Constantin Film International GmbH, and Davis Films/Impact Pictures Inc. (RE5) Present RESIDENT EVIL: RETRIBUTION, written and directed by Paul W. S. Anderson and also produced by Anderson and his Impact Pictures producing partner Jeremy Bolt, together with Robert Kulzer of Constantin Film, Don Carmody, and Davis Films’ Samuel Hadida. Constantin Film’s Martin Moszkowicz and Davis Films’ Victor Hadida are executive producing. The film is a Canada-Germany Co-Production.